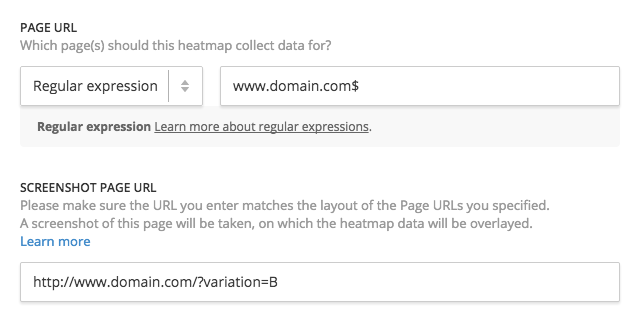 With this set up, Hotjar is able to record Heatmaps for the A/B test if the URL is different for each variation. Two separate Heatmaps should be created, in this case, to track both pages. You can view our Heatmap Guide to learn how to setup Heatmaps. If your A/B test loads different content randomly each time a new visitor lands on the page, Hotjar will be unable to record data for each variation separately. To make Hotjar take a screenshot of a particular variation, you can use the regular expression option. In the example above, Hotjar will collect data from all visitors who visit www.domain.com, but will display the screenshot of www.domain.com/?variation=B in the Heatmap report.